The vanity project I have been working on has been completed. Quite a difference when you see the before and after. I was able to paint a walnut wood grain on the white vanity and really you can't tell it's not real wood. Painting projects like this one show the biggest contrast. 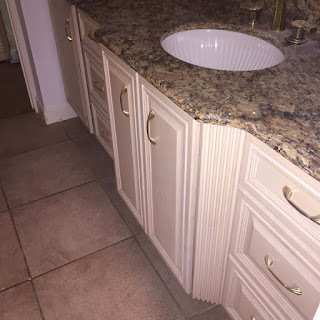 Huge, huge difference in the look and feel of the bathroom with this vanity update. The room and the vanity look a ton richer. I had posted this first photo yesterday but I really like it. When you look at how great the wood grain came out and compare this photo to the next one which is a before shot you can really see the huge difference of the makeover. The photos of the completed project do not show the new hardware for the handles but they are getting an updated look also. This next photo is pretty accurate as far as a color match to the wood tone I created. It is hard to get good photo in the first place but having to photo in a small room is a real challenge. I use the same step by step techniques for painting vanities and kitchen cabinets to look like wood as I use when I paint a standard white metal garage door to look like wood.